KingsIsle's newest mobile game, EverClicker, is now global and available for download through app stores! 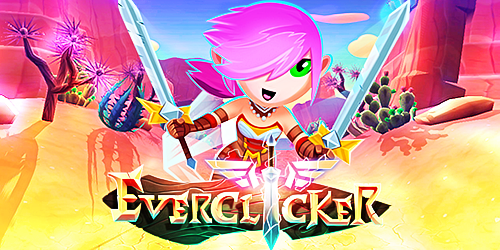 EverClicker is a 3D adventure like no other! The further you travel, the more amazing heroes you can awaken! Empower your troop with special powers and cool effects, and celebrate victories in an upgradeable Feast Hall. With each click, you have the power to unlock magical spells, rare items and more from the mysterious world of the EverVerse. You can connect with your Facebook friends and make new ones, and gift them free goodies everyday! Important note: something that you might be worried about when you start playing is the fact that you "lose" levels when you defeat the Star Devourer. In fact, your Heroes levels aren't really levels. Your progress through the game is correlated with the number of "Stars" you have collected after defeating the Star Devourer, which are directly noted on the leaderboards. Goal #2 – Collect 4 Stars to earn 800 Crowns. Once you hit a goal, you will receive a message in your EverClicker in-game mailbox, with a code that you can redeem for Crowns in Wizard101 or Pirate101! Click here for Frequently Asked Questions regarding this limited time offer.